Skeletal Mages are the results of sacrificed apprentices of those seeking to master the necromantic arts. Unlike the usual skeletal undead, these creatures retain much of their intelligence and cunning from their prior existence along with some spellcasting ability. They also greatly detest the living, which may be based in part on resentment of their current condition. 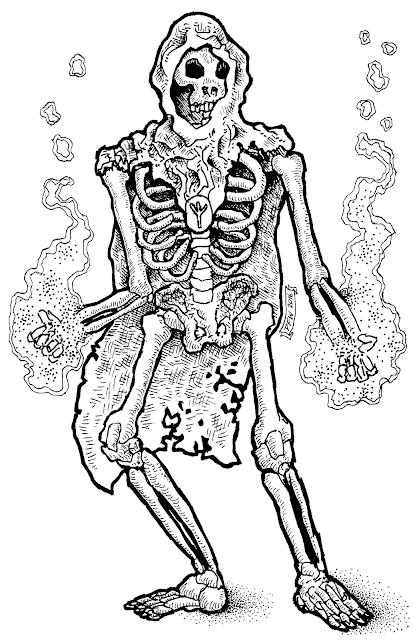 Treat Skeletal Mages as third level magic-users as far as their casting abilities go. They regain spells at the stroke of midnite, no rest or studying needed. They may not swap out spells - the ones they know are the ones they have memorized. Note: Skeletal Mages speak the languages they knew when they are living and can be bargained with. Whether they stick to the terms of such bargains is between them and those that strike a bargain with them. Nice. Especially because it's Lite but really under any circumstances it should have a sample spell list. #ConManKen Plays "Let's Make a Deal!"